You have likely noticed that downloading a free app from the iOS App Store triggers the ‘Enter Password’ dialog screen on an iPhone, iPad, or iPod touch. While this is a valid precaution to prevent unauthorized users from installing apps onto an iOS device, it’s not always desired, particularly for shared iPads and iOS devices used by multiple users and kids. 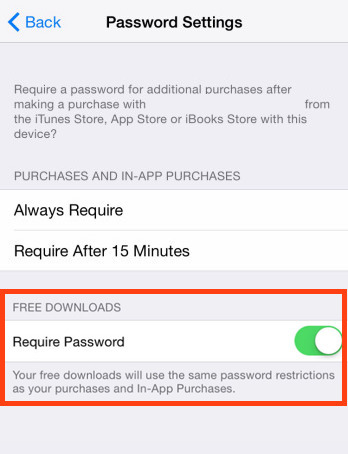 With the help of a simple settings adjustment, you can prevent iOS from requesting a password to download a free app, while still maintaining the password requirement for downloading paid apps. This has no impact on downloading paid apps or making in-app purchases, which should always be password protected to prevent unauthorized transactions on an iTunes Account (you can also just turn off in-app purchases in iOS too). * For devices configured with parental control restrictions, you will find these options as part of the General > Restrictions settings. Note this settings option is not available if you use Touch ID for password entry and device unlocking. It becomes available if you disable Touch ID, but Touch ID is usually a much better security mechanism than a simple password entry, so for iPhones that would not be recommended, though it could be valid for some shared iPads. How useful this is likely depends on how the iPad, iPhone, or iPod touch is used, and for some situations this can be incredibly helpful, particularly for devices shared by families and kids. And once in Restrictions, where do you go and what do you do? I can not find “restrictions” in settings and it’s not under general.What shall I do? What shall I do after I go in content and privacy restrictions? poor article as per previous comments, please research all of the alternatives before sending readers on a wild goose chase. mike did you actually read the article or are you complaining because you have no idea what you’re doing, probably the latter huh? yea, just like an adult mag, didn’t read the articles. states pretty clearly that you have to have TOUCH ID TURNED OFF or not have touch id at all to find this feature. i like touch id so there is no way i would disable it just so i can download free apps without putting my thumb onto the reader. tough stuff. Then you will find the feature in your iPhone or iPad settings, where it will be in one of two mentioned locations depending on what your Restrictions are set at. I am literally giving you the cliff notes version of the article, which you obviously did not actually read. Please read the article before sending commenters who did read the article on a wild goose chase of replying to commenters who did not actually read the article. Any way to do this in OS X for the App Store? Not at the moment, at least without saving the password to keychain, but then someone could buy apps from there too. Maybe a feature in next OS X release. Why does my favorite thing always ask me for my password TWICE? Because you entered your password wrong the first time? Type your password properly if you want your password to work. IPod touch, parental controls off, no Touch ID and this doesn’t work. We have the latest update. Jordan, I am glad you got your free app downloads without having to enter your password, because you like music and your burgers are the best. Did you ever resolve this? I’ve been having the same issue with an iPad mini. What if the switch is grayed out? I have an iPod touch 6th generation. I did this, and it STILL makes me sign in for free apps and updates. Anybody know why? Hi while I am try to downloading it’s so purchases.so I ask possible without purchases download application. Anybody know. When I turn off password required , They said they need password to off the button. The new update of iOS will not let you turn on free downloads without entering your password, many complaints hopefully will change this in next update! Oh so you can’t do it all anymore? I mean the option is still here it just won’t work. Btw I have the thing on the grey side. It doesn’t work. Do I have to move it to the green? Same thing is happening to me. It works fine, until I add restrictions for my kids. Like restrict adult content, explicit music, and so on. Tried everything as stated above and still have to enter a password for everything including iCloud apps. Same here, July 2017 and I’ve been through every setting and help forum I can find. I have it set up to allow but it will NOT allow free app downloads without a password! Apple needs to fix this! I want things for free because I don’t remember my passwords.